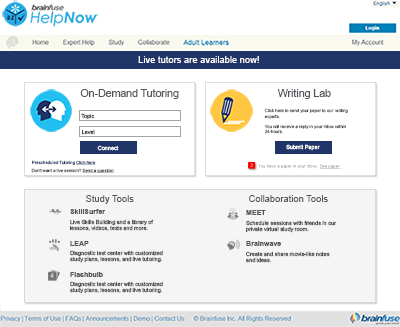 Students enjoy live, on-demand homework help from Brainfuse-certified tutors in a variety of college subjects. Tutors and students communicate in real time through the Brainfuse Online Classroom. Whatever a student types, draws, or shares on the screen, the tutor sees, and vice versa. All sessions are recorded for later review. Our Question Center is ideal for students who have questions outside of service hours or who require a detailed, structured explanation of a difficult academic concept. Students simply submit their question (and even attach supporting documents) and we will respond within approximately 24 hours. Brainfuse offers tutoring services for non-native English speakers. Please contact a Brainfuse representative for information about support in specific languages.